Dev.to is a digital community for developers. It has built a community around content; Can it scale to collaboration and commerce? Dev.to is a digital community for developers. Developers cross-post their blog posts on the portal. It is a smart tactic to build the platform with user-generated content. Though it is dependent on user-generated content, the quality of each post have been high. There have not been much promotional posts. Recently, Dev.to introduced questions and answers. These are unlike the ones you see in Stackoverflow. Questions in SO are about code. SO moderators don’t entertain, subjective questions; they also don’t entertain questions pertaining to non-code, like career questions, best practice questions, and so on. Dev.to allows all of them. The portal is lightweight. Unlike few other developer portals, every part loads fast. So you are not clicking and dwindling your thumbs before you could read a post. If it was slow, they couldn’t have built a community so fast. Publishing is lightweight too. Login is via twitter; there is no user registration, confirming your registration, or filling out ton of information as if in a police station before publishing a post. I posted my first post on Jan 21st. It was a cross-post about a topic that I love — learning as a developer. It received quite a good response. Ben, co-founder of the site was the first one to appreciate. It is entirely possible that I’m biased towards the site because of this experience :-). I’ve been posting since January. I also answer questions. Feel free to checkout all my activities from the profile page. As I mentioned in a Hackernews comment, dev.to has become one of the site, I visit daily. While taking my morning walk, I thought about what I get out of Dev.to and what I would like to see in dev.to. Keep in mind that I don’t know the future roadmap of Dev.to and I’m not in any position to influence the future direction. This is an opinion of a happy and a regular reader. Content: Dev.to is full of user generated content. Almost all of the content is useful in your day to day work, meaning they are all “how-to” articles. 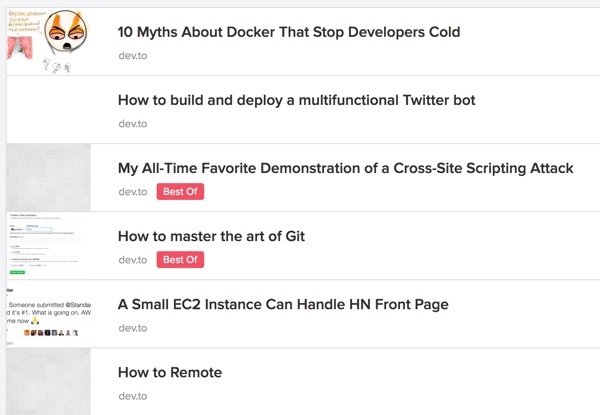 My Pocket reading list is full of articles from dev.to. Community: Because of high quality content, dev.to has built a valuable developer community around it. There are architects, product managers, and beginners. There are developers who use all programming languages. This diversity brings with it, its own depth. I love to interact with the community and learn from them. So far, I’ve not read a “RTFM” type of a condescending comment, which is prevalent in developer community. Content and community around it are the two factors I have enjoyed with dev.to. I hope they keep these tight as they scale. It is a challenge, but I hope Ben and team are able to meet the challenge. As I said in a previous para, I was thinking about how else the portal can be useful (not necessarily monetized, but useful). These are the two aspects that came to my mind. Collaboration: As the community grows, why should it limit itself to passive consumption and few answers to question? Why can’t the community collaborate for each other’s benefit? The collaborative work itself can happen outside dev.to. But it can enable searching for people. Taking the second question in the above list, dev.to can enable searching for people who have worked in d3.js and shown willingness to collaborate. Commerce: Most developers are altruists (at-least the ones who come to dev.to. Today there is no money to be made there; why would they come there, otherwise? ), but we have bills to pay. When we collaborate, we like to get paid. Again, the deals can happen outside of the portal; but the portal can have all the essential elements to support commerce. Coming to think of it, there could be a marketplace within dev.to. Every market place wants a community built around it, because people buy from people they know and trust, aka community. If so, why can’t dev.to go from community and to commerce? It can also partner with other marketplaces like Ionic marketplace and Evanto market. Today dev.to is simple and there is certain attractiveness in simplicity. I hope these changes won’t break that simplicity.